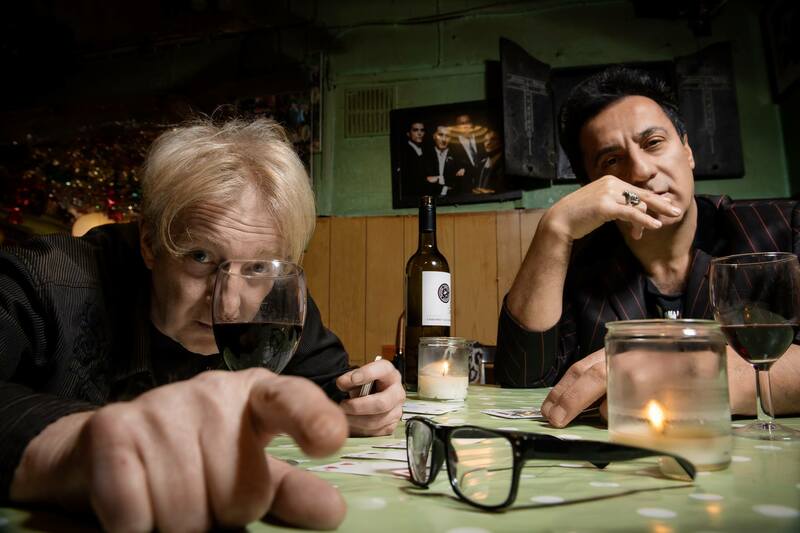 Rat Scabies, longtime drummer for The Damned (real name: Chris Millar), has continued pounding the skins while also teaching at universities. PKM spoke to him about his collaborations with Donovan and the Dandy Warhols, his solo album, and more. We all know him as the cartoon-like punk in a leather jacket, tight jeans and rooster cut. Chris Millar, a.k.a. 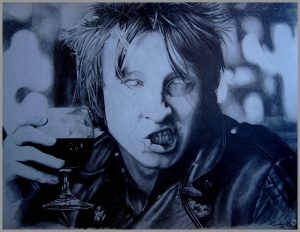 Rat Scabies, was the drummer for the first ever British punk band, The Damned. They released the single “New Rose,” in 1976 and were the first English punk band to tour the United States.From his beginnings, as a baby abandoned on a doorstep, to running away from home at 14 and joining his compadres in creating a musical and social revolution, his intelligence and street smarts helped him not just to survive, but to thrive. After 19 years in the Damned, Rat called it quits when tensions heated up over their album, Not Of This Earth. Brian James is the only original member he still talks to. Today, Rat is called on by universities to educate their students on, what else… punk. He has a wife and three children, one who is involved in the rap game, carrying on with the musical genetics given to him. One recent musical project is called the Mutants, with Chris Constantinou of Adam and the Ants. They invite new members to join for each album and drive the theme towards a certain region. So far they have done London, Tokyo, California, and New York. First Single off Rat’s Debut Album! 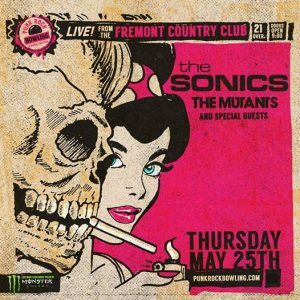 Each topic chosen will be at the raconteurs discretion, as will be the delivery. 2: Lost or Hidden Treasures. 4: Family, Relatives, Feuds & Fights. 6: Lake or Land Monsters. 8: Pets & Livestock – Troublesome Goats. 12: Gardeners – Giant Marrows etc. 14: Musicians, Poets & Writers. 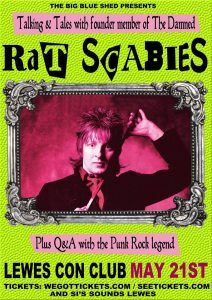 founder member of the Damned, Rat Scabies. Lewes Con Club – Monday May 21st 2018. 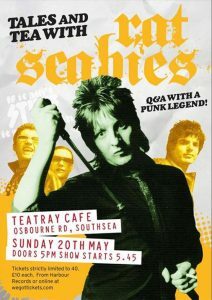 Join in the Q&A with our man Scabies. 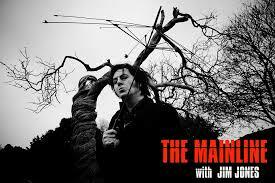 Rat is being interviewed on The Mainline with Jim Jones on Thursday 19th April 2018. Don’t wait – pre-order your copy now!! 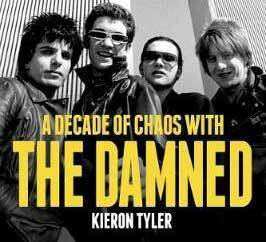 An in conversation that celebrates Kieron’s meticulously researched book and spans The Damned’s individual involvement in the birth of British Punk Rock, their signing to Stiff Records, making friends with Marc Bolan and Motorhead and charge off the rails at great speed. Conflicts, disarray and success on both sides of the pond, we’ll explore and reveal how – and why – the wayward, wild and wilful Damned are the punk band that have survived. When The Damned reformed in January 1979, after a nine-month break following the departure of original guitarist Brian James, nobody knew quite what to expect. James had been the band’s principal songwriter on their two albums to date, and it was unclear who from within the band’s ranks could replace him. Recruiting ex-Saint Algy Ward on bass (Lemmy had briefly held the job), the band signed to Roger Armstrong’s Chiswick Records, and were sent to a Croydon studio for a couple of weeks and told to “make some noise”, as Ward remembers. The results were impressive: Captain Sensible’s “Love Song” gave The Damned a Top 20 hit, and he followed it up with the poppy, hippy-baiting “Smash It Up”, which although effectively ignored by the BBC, became a minor hit in winter 1979 and subsequently the band’s unofficial anthem. 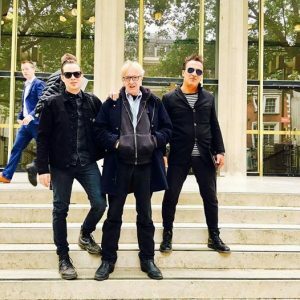 When it comes to punk bands, the Damned may be the most influential of them all, and their original drummer Rat Scabies among the most stylishly destructive sticksmen ever. Formed in 1976 in the U.K., the Damned is credited as the first punk band to release a single (“New Rose”) and an album (Damned Damned Damned), and the first to tour the United States. 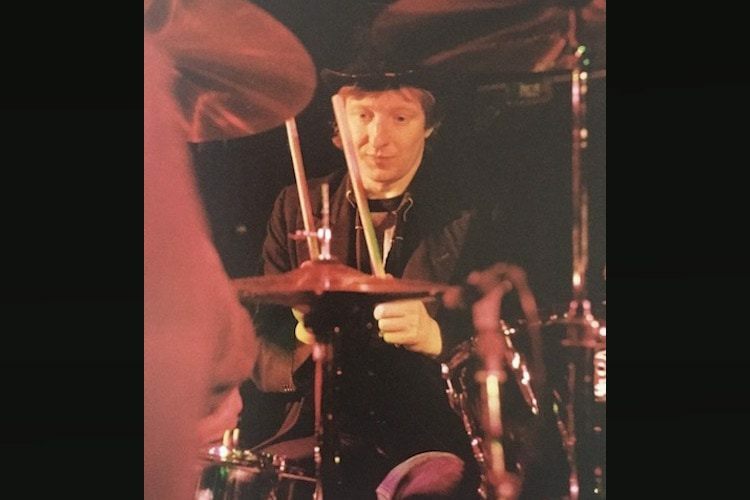 Rat Scabies’ mix of punk aggression and Keith Moon–style flamboyance make him one of the more entertaining and incendiary drummers in rock history. Listeners need only hear “Love Song,” the opening track from the band’s 1979 masterpiece Machine Gun Etiquette, to understand the roots of Green Day’s Tre Cool and any number of modern punk drumming icons. 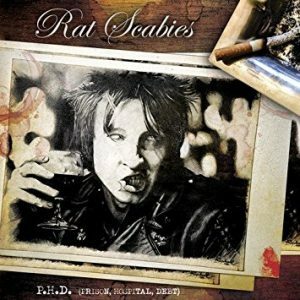 Rat’s in The Pub …..
Our discussion forum, The Pub, is the central hub for all things Scabies. You won’t always find him in there, but when he is, make sure you haven’t missed out on the chance to say hullo! Join Rat when he is interviewed by Barry Cain in the Pavillion at the Rebellion Festival in Blackpool on Friday August 4th at 5.30pm. Get your tickets here!